The concept of theocentric counseling and healing in our jurisdiction has its roots in the early 1930's when Joseph Rene Vilatte as an Archbishop and Chiropractor, wanted to see theocentric holistic healing earn its respected place in society. Originally there was no official name or licensing of such healers that was open to those who were members of the Orthodox Christian Church. Although this idea became dormant after his death, in 1980 his dreams to provide an organization based upon solid principles and centered on theocentrism, with good ethics and sound practice norms, came to fruition. 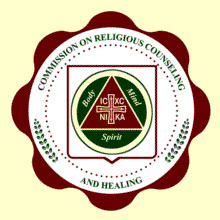 Since 1986, the Commission on Religious Counseling and Healing has accepted into membership all eligible healers and counselors who believe in the theocentric holistic philosophy and profess that: "All healing comes from God as a blessing (or grace) to the affected person through the hands or intervention of the healer." Licensed practitioners know that it is not they who heal, but God who is the Divine Physician and Healer, and they are merely His instruments. The Council on Chiropathy was first registered with the California Secretary of State on June 2, 1986. It was joined to the Commission in 1990, but remains a separate entity under its supervision which awards doctors of Chiropathy the Fellow of the Council on Chiropathy. The Commission is under the omophor (auspices) of the Syriac-Greek Antiochian Synod of the Eastern Orthodox Catholic Church. 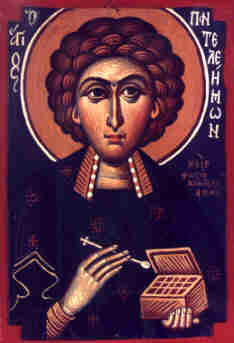 The Commssion is under the patronage of Saint Panteleimon.